Nose: Vivid, vibrant and refined. Apricot, cranberry, ginger and honey arrive at the nose in a richness typical of the Premier Cru. Palate: The rich honey taste remains on a long finish. The Cognac producers Hine have released an exclusive single-estate Cognac from their very own vineyards. The Hine Bonneuil 2008 hails from the Grande Champagne area, and is part of a series from the signature maison. Its Ugni Blanc-variety grapes originate from the Premier Cru of the Cognac region, and give a singular insight into its finesse. A homegrown Cognac in every sense of the word, it is named after the nearby village of Bonneuil. The Bonneuil 2008 is a fine example of a single estate Cognac, hence its Vintage categorization, and a limited 16 casks were harvested in 2008. Hine have produced the Bonneuil 2008 as a signature expression of the Grande Champagne cru. The chalky soil makes for extremely refined Cognac with a distinct identity, and this Cognac house seek to remain as true to the wine as possible. The Grande Champagne cru has been formed over millions of years of fossilization, and it is this fine limestone soil that gives optimum conditions for growing grapes. Only 450 numbered bottles have been produced of this rare nectar, so don’t miss out. Bottled on 19th July 2018, the vintage year enjoyed a glorious summer and harvest that made for vibrant eaux-de-vie. The flavors unfold bit by bit, thanks to the long process of distillation on the lees, and then its long maturation in oak barrels. This is truly an ode to the Grande Champagne cru. Hine Cognac are renowned for their singular takes on terroirs, harvests and eaux-de-vie, demonstrating expertise that dates back a quarter millennia. They have seen six generations of Hine family members passing along their wisdom of the vines and cellars, and identifies itself in the Fine Champagne region. Hine Cognac celebrate the fundamental concepts of Cognac and of nature: that is of the vine, the grape, the climate and the soil itself. This is how they muster their signature aromas. The Hine Bonneuil is a fine example of this maison’s quality and respect for the vineyard. This Cognac is great paired with food, to bring out the flavors and aromas one by one. Serve it frappe with some ham or oysters, or try it chilled. 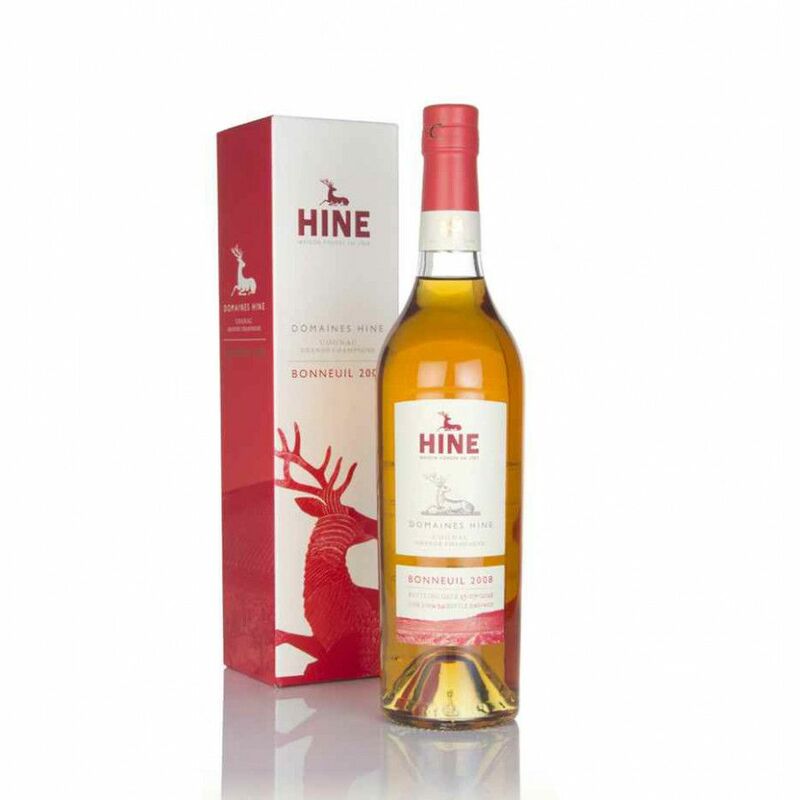 It arrives in a coral color themed bottle, inspired by its cranberry aromas and notes, that is similar to the other single estate Cognacs by Hine, including the 2005 and 2006 Cognacs.